The currency of Ukraine is the hryvnia (UAH), pronounced gryvnya. There are 100 kopecks in a hryvnia. Notes come in denominations of 1, 2, 5, 10, 50, 100, 200, and 500 hryvnia. There are 50, 25, 10, 5, 2 and 1 kopeck coins. There is also a 1 hryvnia coin. The Ukrainian hryvnia exchange rate is no longer fixed to the dollar or any other currency. A more comprehensive list of exchange rates can be found here. Contrary to popular misconception you can’t use foreign currency for most transactions in Ukraine. 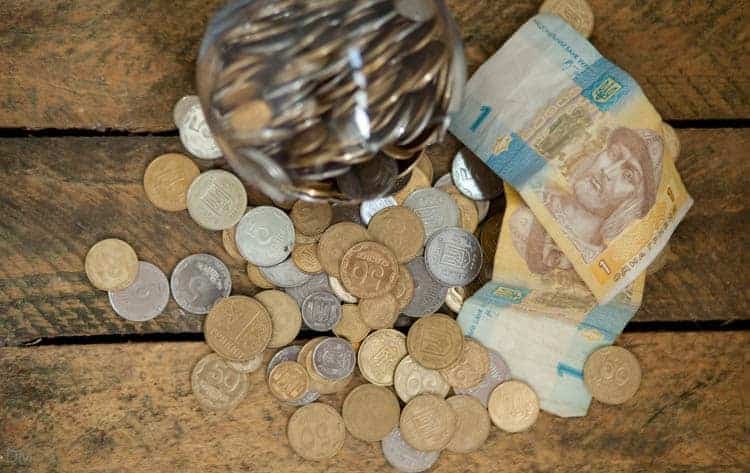 You will need to change your money in hryvnia to pay for most goods and services. Some private apartment owners will accept (or even insist) on being paid in dollars or euros. However, you’ll definitely need Ukrainian currency to pay for almost everything else. This would include food and drinks in restaurants and bars, admission to tourist attractions, purchases from shops etc. Ukrainian currency is almost impossible to obtain from banks and exchanges outside Ukraine/Eastern Europe. A handful of establishments in Western Europe offer it but the rates are extremely poor. There’s no need to panic though. It’s almost impossible to walk down any street in Kiev without stumbling across a currency exchange. All will accept euros, sterling, dollars, and rubles. Your notes will need to be in pretty good condition. Worn and tattered ones will usually not be accepted. Don’t bother trying to change coins. Exchange rates are clearly displayed on a board outside the exchange. The spread between buying and selling rates is fairly narrow. There are currency exchanges at Boryspil International Airport and Kyiv International Airport. Exchange rates are usually better at the exchanges in the city centre, but they’re a good option if you need to some currency for a taxi or bus. You can bring the 10,000 euros in cash (or equivalent) into Ukraine without making a formal written declaration to customs officials. ATMs (known locally as bankomats) are commonplace throughout Kiev and the Ukraine. As with money exchanges you don’t have to walk far before coming across one. If you’re not having any luck, head for the nearest McDonald’s or Metro station. Most will have a cash machine near the entrance. There are ATMs at both of the city’s airports. All cash machines in Ukraine have an English language option and accept foreign debit and credit cards. Cards are occasionally rejected, though in our experience this seems more likely to be down to anti-fraud measures taken by the card issuer. It’s a good idea to telephone your bank/credit card company before travelling. Inform them of your trip and intention to use your card in Ukraine. 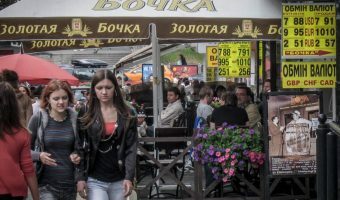 MasterCard and Visa are widely accepted at most hotels and restaurants in Kiev. In smaller/budget establishments you should be prepared to pay in cash. Hi, I need to change South African Rand. Where can I do this? Are coins actually used in Ukraine given their very low value? I would expect that like other countries where a single currency unit exists as a note (for example Qatar, Azerbaijan), most shops would just have prices in whole hryvnia and not even bother with kopeck. And since the 1 UAH coin is not common, and there is no 1 QAR or 1 AZN coin, I might expect that only supermarkets even have space for coins in their cash registers. Is this the case in Ukraine? Coins are used, even the low value ones. It is a bit of a pain as you always end up with a lot of small value coins after a trip. I will fly in two weeks to Kiev. Can I Change my Swiss Francs to Hrywnia or not? Otherwise I will Change euros in Switzerland and then Change it again in hrywnia. Hi, I’m visiting Kiev this weekend for a short break and would like to know if credit cards are more widely accepted in restaurants and bars now? Was in Kiev this year, and most of the cafes, bars, restaurants I was in accepted credit cards. I think there was only one place I was in that didn’t. So better to have some cash available if possible. Hi, I was just wondering–is it relatively easy to exchange Canadian Dollars in Kiev? If most exchange offices accept CAD, I would avoid exchanging to USD prior to my arrival in Ukraine. Thanks, and you have an excellent site! Can you withdraw Euros from any ATMs in Kiev? No you cannot withdraw euros from Ukrainian ATMs. Is it still the case that Australian dollars cannot be changed in Kyiv? I would be disappointed to change to Euro or US dollars and then have to change them again. In my experience I just use a card at a atm. Your bank will charge you a fee but often easier and cheaper. Notify your bank or credit card company that you will be in Ukraine. I am going to the Ukraine in May 2016. Can I take and use US dollars there, as I am struggling to find currency in the UK? I recently visited Ukraine and (stupidly) forgot to change Hryivnas back to USD/Euro at the end of the trip. What’s the best option to exchange Hryivnas back to a hard currency in the US, UK or Western Europe? Thanks in advance for your help! I am planning a trip in March 2016 for dental work. Is it still possible to change gbp? Another site says they won’t change pounds at the minute. When I am departing from Kiev, is there any limit of the amount of Ukrainian hryvnia that I can take back with me? For instance if I am departing from Kiev airport with 2,000 UAH in my wallet and I can not change back to euro because I lost my receipt, will it be fine or there is a maximum amount I can bring it back with me? Is there a big difference in exchange rate when withdrawing from an atm in Kiev (English bank account) and exchanging your money at a kiosk? I don’t want to withdraw 100 pounds worth of uah and then find it’s a terrible exchange rate. Hello, I realize this page is for Kiev, but I need to ask somewhere. If airfare and hotel are excluded, how much USD per day should I budget for two people visiting Odessa? What type of standard of living should I expect for your answer? Oops, forgot to ask something else. What denominations of UAH notes are difficult to use? I remember in Paris it was nearly impossible to use a 500 EUR note; took hours to find a bank that would break them. I could not get my Ukrainian currency exchanged back to Euros at Kiev airport as I was not provided with a receipt when I purchased and so the exchange desk would not accept them. I am now having difficulties finding anyone to buy or exchange the currency here in Ireland. I will be visiting Russia soon. Is it possible that it will be exchanged and accepted there? Two year ago I returned to Boryspil from Georgia and was waiting to exchange Lari back to Hryvnia. I eventually got to the front of the queue where I got the most emphatic “NO!!!! !” I have ever had in my life. I could not even ask the girl where I could go to exchange them, she just kept saying shouting “No No No!” Thank God the rest of Ukraine is slowly getting away from this old USSR mentality. Even if this girl was having an off day she remains the rudest Ukrainian I have ever met. I think it goes without saying I have never returned to this kiosk, to buy or sell, even though I spend all of the time I am allowed in this wonderful country. I make sure my bank has my Kyivstar phone number. It is a good idea to buy a local sim card at the airport. I’m going to Ukraine in July and am going to change my currency as I go to avoid bringing any back with me but what I wanted to know is if we arrive late in the evening will I still find somewhere to change my currency? The currency exchanges at Boryspil International Airport in terminals B and D are open 24 hours a day, 7 days a week. Well, at least that is what the signs say. I personally always arrive in the daytime so can’t verify that they actually are (though I’ve no reason to doubt the official info). Failing that, your bank cards should work and there are ATMs at the airport and all over the city. Just make sure you call your bank before you leave and tell them you are going to Ukraine and will be using your card. They will sometimes automatically block card transactions, especially in countries with a reputation for card fraud. I’ve also heard recently that some US cardholders are having difficulties with ATMs when things have been fine for them in the past. Only your bank can tell you the situation. Call them. On departure, the last time I was in Ukraine the currency exchange person would not not exchange my unused Ukraine currency. Some rule. Saved by a friendly local who did it for me. What are the rules around this? How do I confidently exchange my unused notes? If you got the cash from an exchange kiosk you need to keep the receipt to change it back. If the money came from the ATM, I believe you need to keep the receipt too, and can only change it back at that bank. I’m British and live in Moscow, and I am paid in roubles. I’m visiting Kiev this weekend for a short break and wondered if roubles are still easy to exchange, due to the political tensions. Also, do you know if the rouble rate is less favourable. I have been advised by a colleague to change my roubles into dollars or euros before I go, but I don’t see the point in losing out twice on the exchange rate if I don’t have to. You can still change roubles. You are correct. Don’t bother changing into dollars before you arrive. It’s pointless to quote rates. They are changing daily and both the rouble and hryvnia are volatile at the moment. The rate is what it is and there’s nothing you can do about it. All I can say is that the spread (difference between buying and selling rates) is higher than it has been historically. So change only what you need. Thank you for your advice. I appreciate your help. I am from the UK, travelling to Ukraine for the first time later this month. I note that the Sterling/UAH exchange rate has moved from 23 a year ago to 42 now. As Ukraine was previously a cheap destination, should I assume it is now a VERY cheap destination, or have prices risen fast there? I’m looking at restaurant prices, hotel prices and clothing prices? Thank you for your help. Hi. It was actually about 16 UAH to 1 GBP one year ago. Two years ago the UAH/GBP rate was around 12 UAH to 1 GBP. So the rate has actually moved a lot more than you thought. Kiev is now a very cheap destination. Prices have gone up, but not as much as the change in the exchange rate. Of course it depends what you are buying. If you are going to a top steakhouse restaurant and eating imported US beef you are not going to see any decrease in prices. If you go to a regular restaurant where they are primarily using local produce then you are going to see the benefit. Hotel rates are a lot cheaper. There are other factors such as low occupancy at play though too. There are some real bargains on apartments if you look on Airnb. I can’t comment on the price of clothes in Ukraine. I buy most of my clothing in the UK and haven’t paid attention to the changes in price. Most of the decent stuff is imported and has historically been priced higher than in the UK so I have never bothered checking it out. Thank you Ed! I had no idea the currency had fallen so much. I’ve just looked at your recommended Airnb and the prices are unbelievably low! I have booked accommodation at the 11 Mirrors Hotel for my first three nights, but as I am staying nearly two weeks, I’m planning on moving to one of those apartments. As you are so informed, I’m told that the easiest (not cheapest) way to get to Sumy from Kiev is by taxi. It’s a 3-4 hour journey and I’m told its about $150. But that rate may be pre-crash. Would you recommend I took US Dollars with me? All other sites say that UHA’s are really the only currency to have. Thank you. You’ve picked a good hotel. 11 Mirrors is great. It has a fantastic location, right in the heart of the city. I’ve no idea what the taxi fare to Sumy would be. I imagine any rate that was valid pre-crash isn’t valid now. Personally I would go on the train. There are a couple of trains from Kiev to Sumy – the 776 and 780. Both have daily departures and the travel time is around 5 hours. If you go in the cheapest class the ticket is about 80 UAH, or £2 in Sterling. First class price is around 115 UAH. This is a lot cheaper than travelling by taxi and there’s probably little difference in travelling time. You can book online at ticketsDOTua or just wait to you get to Kiev. The girls at 11 Mirrors may be willing to sort a ticket out for you or at least point you in the direction of a nearby English speaking travel agent. Or you could just go to the train station yourself and purchase them. I work in a company and we sell books to Ukraine. They pay us with credit cards. So if we sell a product for say 100 UAH per our price then the credit card holder is charged much more as the bank in Ukraine has a read bad exchange rate. It apparently converts such payments to abroad into USD and the 100 UAH payment becomes 120 UAH. Any experience with this? It’s not absolutely clear what type of transaction you are referring to? Online, direct billing to credit card holder etc.? This is really a question for the entity processing the transaction. Without further details I can’t really help. However, what I can say is that whoever is processing the foreign exchange transaction will make a profit on it. They are not charities. From what you are saying it sounds like the processor is making their profit at the customer end of the transaction and making sure you receive the full fees. If you want to make sure the customer pays the real sales price then I suggest you bill them in UAH. Then you’d take the foreign exchange hit when you convert back to USD. The 20 percent fee, if it is that, sounds very excessive. If this is the case I’m sure you can find a cheaper payment processor. Can you exchange Australian dollars in Kiev? I don’t believe so. I’ve never seen them on the exchange board of any of the money shops. I suppose it is possible that some of the large banks may have a stock, but I’m not going to telephone around for you. If they do, I guess the rate you’ll get won’t be that good. If I were you I would bring dollars or euros. Very few Australians visit Ukraine (see the tourism statistics). Presuming you are Australian, you’ll also need a visa. Is it best to change my pounds into dollars in Kiev or in the UK? I’m not sure why you will need to change your pounds into dollars in Kiev. Sterling can be exchanged for Ukrainian currency in Kiev at all of the banks and money exchanges. There is no need to get dollars first. Businesses in Kiev usually only accept Ukrainian currency so changing your pounds into dollars is pointless. You will just be incurring additional transaction fees. The exchange rate is great at the moment. Your UK money will go a long way. I’m going to Ukraine next month. Do you know where I can get hryvnias in the UK? Personally I wouldn’t bother. You’ll find it pretty hard to get Ukrainian money in the UK. I know HSBC used to sell them online. I’ve just checked their website and they don’t appear to sell them anymore. Ukrainian currency is pretty much impossible to exchange outside of Ukraine and Russia. You’ll be fine bringing sterling (or euros or dollars) and exchanging it in Ukraine. You’ll get a better rate too. You can also use you bank card. ATMs are pretty much everywhere and almost all (in fact if not all) have an English language option. Always let your credit card or debit card company know you are travel to the Ukraine or any other CIS country. It’s a 2 minute phone call before you leave and could possibly save you some major hassles. It is very common to have your CC company suspend your card if you use it in Ukraine. Also make sure to check the ATM you are using for 2nd scanners or cameras, these scams used to take place a lot in Kyiv – not so much anymore. Use an enclosed ATM – they are becoming more common in Kyiv as Euro banks by out the local banks or one with 24/7 security. And yes, if you want to live like a Western Kyiv will be very expensive. As a local, not so much. Make sure you take your mobile phone with home country phone SIM card installed when drawing money/making purchases on your credit card. I withdrew some money from a bank in Kiev using my credit card and it set off some sort of automatic anti-fraud system that resulted in a call from my bank’s credit card department. Had I not answered the phone and verified the transaction was valid, my credit card would have been suspended. Pirate copies of computer software are also a good (but illegal) bargain. You can pick up copies of almost any software package for just a couple of dollars at almost any market. Although prices have increased in Kiev, recently lots of things are still really cheap. These include train, bus and Metro tickets, museums, haircuts, vodka etc. Live like the locals do and you won’t go wrong. Current exchange rates for the Ukrainian hryvnia (UAH) with major currencies (GBP, EUR, USD etc.) plus rates for the currencies of neighbouring countries such as Russia, Moldova, Poland, and Belarus. Find out how much to tip for good service.